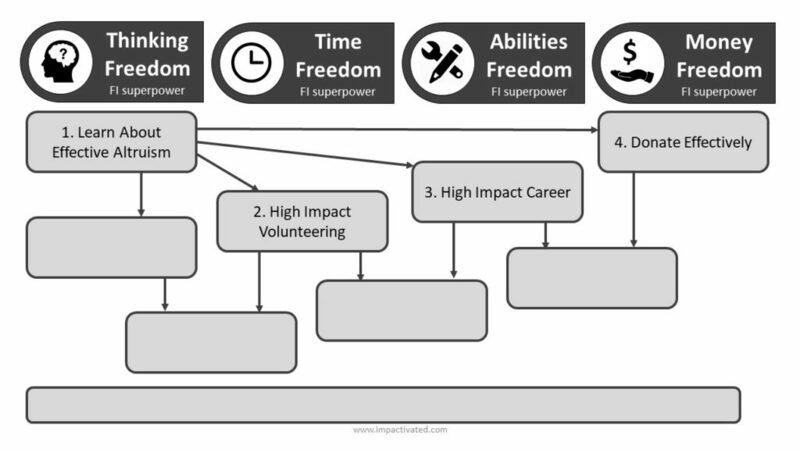 Now that we know we have this incredible FI superpower and a mindset well suited to do good, where do we go from here? What can we do with it? How can I too do something big and that helps others in an effective way? How can I too participate and help make the world a better place? In this post we are going to explore many of the different ways we can do good, helping those who are in need in the most effective manner. Because there are many ways of doing good, we’re going to explore them over 2 separate posts. Something we’ve learned to do well in the FI community is to optimize. We’ve optimized our finances and we’ve optimized “how much happiness we get for each dollar”. We’ve increased the efficiency of our finances so that they can serve our life goals. We use a similar optimization approach in many other aspects of our lives. Some of us optimize on their diet, on their exercise, on their consumption of news or even on their use of technology and social media. Why not optimize the way we do good? 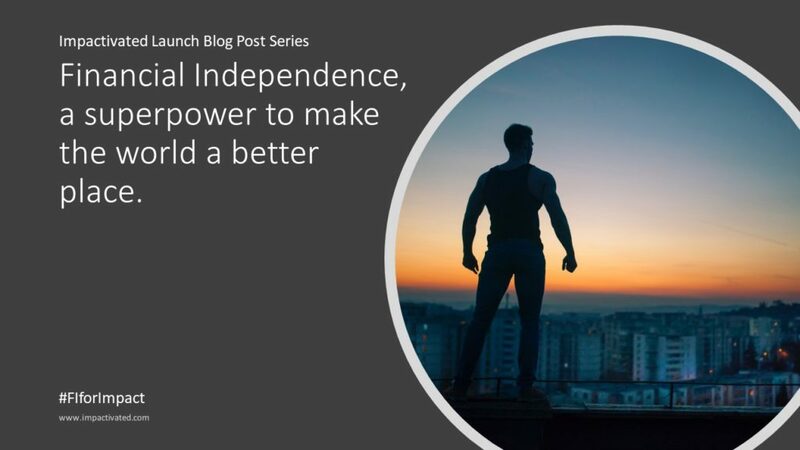 In the financial independence community, instead of just spending on what feels good we ask “what are the best ways I can make my life better with my resources?”. In other words, in the same way we want the most FI bang for our bucks, we can also aim to “maximize the bang for each charitable buck”, as The Economist puts it. Luckily, the question “how do we use our resources to do the most good” has been the key focus of a movement and philosophy for over a decade: Effective Altruism. Rather than just doing what feels right, effective altruism uses evidence and careful analysis to find the very best causes to work on. But it’s no use having a great idea unless you act on it. Effective altruism is also about following through. Just like for FI, effective altruism requires consistency of belief and action. Effective altruism about being generous with your time, abilities and money to do the most good you can. In addition to these criteria, it also important to identify personal fit and make sure you’re well suited to support the cause. This framework has greatly helped me in taking decisions regarding my future path. I highly recommend you learn more about it here. Having an open mind and having spare time definitely helps when it comes to learning something new such as effective altruism, but I would recommend you start right away as this is information I wish I had known about when I was a teenager. In my opinion, this is at least as important, if not more important, than knowing about financial independence. Volunteering is the most logical way to do good for people who have a lot of time to spare. In the FI community, it is one of the most common ways people give back to their community. 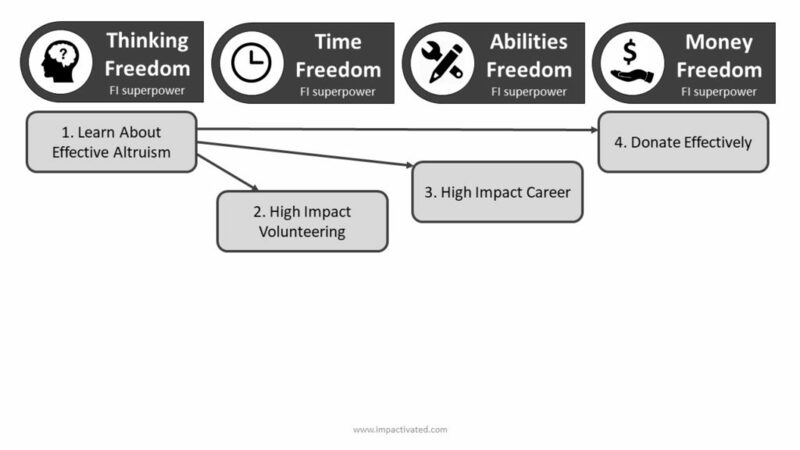 With the time freedom FI provides, volunteering can indeed be a very powerful way to do good. Volunteering is most commonly done with local charities and with groups or for causes you are familiar with. This is indeed a great place to start, as long as you’re certain that the cause or group you support does not do more harm than good. But before you commit to volunteering, I would like to invite you to ask yourself what are the main objectives of your volunteering? If positive impact is part of your response to this question, then I recommend studying the question before commiting to the first attractive volunteering opportunity. Study the question and make sure you become a high impact volunteer. The volunteer jobs that do the least good are ones that are easily replaceable. Volunteering for unskilled labour jobs is often fairly low impact, particularly if those jobs are in the developing world. If you’re flying to Africa to build houses you should think again – odds are you’re taking someone else’s job over there, and then doing it badly. Think about donating the cost of airfare to an effective organisation, and reduce your carbon dioxide emissions. If you’re interested in volunteering for an effective altruism organizations, here is some guidance on how to volunteer or intern remotely and volunteer for short-term tasks. As we all know, financial independence does not necessarily mean stopping to work. Instead it gives us choices. Many choose to continue working, for various personal reasons. What it means is that we do not depend on the pay anymore. This gives us incredible power and options. Money no longer need to be a major decision criteria.. Instead, we can choose other criteria, such as doing as much good as possible. Committing to using your skills to support a high impact cause is probably one of the most impactful way you can contribute to make the world a better place. 80,000 hours advice was developed mostly to advise students and early stage professionals, as that is when the advice is most useful for the general population, when people are starting a career. But the same advice can be used by people in the FI community as they have the choice to start on a new path. The main difference is that we do not have to make a living out of it, which can be both an advantage or a disadvantage. It can be an advantage because we have a longer runway. We are not pressed by financial constraints and if needed, can spend time acquiring the necessary skills without the need to earn money right away. It can be a disadvantage because we don’t have the same urgency to learn and start working on important problems. We might actually even be better suited to have a greater impact faster than students. We often have already developed solid professional abilities in a certain domain. Sometimes, all we need to do is find a way to use those skills in an impactful way. We have often also already proven ourselves, we have a solid network, and a lot of experience. You don’t necessarily need to become an expert to contribute. It is not always easy, but organizations working on high priority causes also need people with general skills found in other lines of work (accounting, writing, reception, law, education, marketing, operation, management, etc.). 80,000 Hours has an incredibly helpful career guide, they have a very solid decision making tool (very efficient also applied outside of the effective altruism context), and they offer free career coaching for individuals interested in working in a high priority area. These tools and services have helped me think through one of the biggest question I was asking myself as I was getting closer to FI: What will I do post-FI? How do I choose what to do, when I have so many options and possibilities? I am truly thankful for all the work they do and I am hoping you too will find it useful. And when you’re ready to take the plunge, please make sure to apply to some of these effective altruism jobs! The same approach we use to optimize our finances can be used to optimize the way we make our money work for others. A big part of the effective altruism movement is dedicated to maximizing the positive impact of charitable donations. It is called effective giving. Organizations such as Give Well, The Life You Can Save and the Open Philanthropy Project are dedicated to assessing charities and projects and identifying those that are the most effective at doing good. They don’t look at the traditional measures for assessing effectiveness such as other charity evaluators do (which actually tends to make charity work a lot more difficult and ineffective as explained by Dan Pallotta in this TED Talk). Instead they assess the actual positive impact per unit of resource spent. Donating to effective charities is one of the easiest ways a person can contribute and do good effectively. As people in the FI community, we’re blessed with more wealth than the vast majority of people on the planet. This means we have an opportunity to do a lot of good as we can donate more to the most important causes. Here is an example showing how donating just 1500 USD a year allows us to have as much impact as a doctor in the UK. And many of us can comfortably donate much more than that. I highly recommend you use the independent recommendations of Give Well and The Life You Can Save to inform your future donations. I also invite you to join me in taking the giving what we can pledge. In the next blog post, we’re going to explore a few other ways we can contribute to having a positive impact. Stay tuned!